Under current Finnish regulation, grid fees and electricity taxes apply to the electricity generated by housing companies within their property grid. The housing company Haapalahdenkatu 11 is testing a smart metering IT service that enables residents to share the generated solar electricity. In deciding whether to invest in the solar PV system, environmental motives of the housing company members dominated the decision-making process. Key success factors were project leaders’ enthusiasm and determination. The test model is promising but regulatory changes are required to make it more economically attractive for real-life conditions. In Finland, there are approximately 2.6 million citizens living in 90,000 housing companies and 142,000 apartment buildings or terraced houses. Currently, renewable energy incentives such as investment grants, feed-in-tariffs or tax deductions are not available for housing companies or for any kind of residential buildings. Investment grants in Finland are only available for companies and municipalities. The Limited Liability Housing Company Haapalahdenkatu 11 is located in Pikku-Huopalahti neighborhood in Helsinki. The two building complex consists in total of 24 apartments and 56 residents. It is taking part in the FinSolar pilot project lead by Aalto University to test a solar community IT service that enables its residents to share the electricity produced by a PV system through their property grid. FinSolar obtained a special permission from the Finnish Energy Authority, Ministry of Economy and the Employment and Financial Ministry. This permission was to test the solar community IT-service from 2017 to 2019 in cooperation with two Finnish Distribution System Operators (DSOs), some housing companies, and other stakeholders. In 2017, the housing company made an investment in a solar PV system in connection with the roof renovation. The solar power system has an output of 8,7 kWp and includes 33 panels and a 12,5 kWp inverter. The size of the inverter is larger than the power output for the future scalability of the solar PV system. Initially, the solar PV plant was intended to produce electricity only for the common parts of the building, e.g. yard lights, elevator, laundry room, etc. The opportunity to join FinSolar as a pilot case for community energy production emerged after the apartment owners had started discussions about the possibility to install a solar PV system. The main project champions were two residents who were part of the housing company’s board. They had a strong motivation to reduce the environmental impact of their residence. In addition, they had become familiar with solar PV technology at their place of work. Before starting the project, the two champions were also inspired and encouraged by a local solar energy advocate and expert. During the implementation phase, a project manager from HSSR Oy played a key role in providing them with the needed expertise. Project supporters’ were motivated to join the FinSolar project as they had a desire to set a good example for other housing companies in Finland and to help remove legislative obstacles for similar community energy initiatives. Even without the opportunity to join FinSolar, the majority of the housing company’s residents would have still decided to make the solar PV investment. Therefore, the opportunity to join FinSolar influenced only the investment decision, which was to purchase a larger PV system. By doing so, the generated electricity could go beyond communal spaces, allowing residents to also benefit from it in their own apartment. The shareholders needed to decide in the housing company’s general meeting regarding the solar PV investment and the participation in the FinSolar pilot project. Shareholders had different views and therefore it was difficult to reach a consensus. Furthermore, project opponents raised arguments against the profitability of the investment. The project opponents also considered the testing of a new model too risky, as it could have been non-compliant with the Finnish legislation after the end of the FinSolar project. On the other hand, the project leaders and supporters inside the housing company emphasized the importance of acting for the environment. Eventually, the decision was made by a vote. Since the project was expected to reduce the general costs and the amount of needed capital was not so big, most of the residents did not see the low profitability of the investment as an obstacle so they voted in favor of the solar PV investment. The solar PV plant is owned by the residents through the Limited Liability Housing Company. In these companies, the number of shares that apartment owners hold depends on the apartment size and their payments to the common investments which are proportional to the shares. The solar PV plant is paid and owned by the residents in relation to their number of shares in the housing company. Therefore, the smart metering IT-service has a calculation algorithm that distributes hour by hour the solar electricity production to the apartments according to their size and percentage of shares. The cost of the system was approximately 13,000 € including 24% value added tax (VAT). The net present value (NPV) of the investment is approximately 5,000 €, the payback period of 21 years and the solar electricity production cost is about 8,7 ¢/kWh with an expected system lifetime of 30 years. The investment was financed with a bank loan. Commissioned by the housing company, the roof renovation and solar PV system purchase was carried out by HSSR Oy company who specialize in renovation projects. All phases of the project implementation including permitting, tendering, supervising the installation works, etc. was covered by HSSR Oy. The IT service needed to allocate the solar power shares that were provided by the local Distribution System Operator (DSO) Helen Sähköverkko Oy. The housing management company Talohallinta Oy took care of all the contracts and paperwork. As a result, the project was very easy for the residents – they only had to make the decision on whether or not to invest in the solar PV system. After the first year having solar panels in place, the housing company had made savings in the common electricity bills. This was felt as an encouraging result leading some of the residents to use the savings to purchase more plants for the gardens. Currently residents of the housing companies throughout Finland cannot produce solar electricity for self-consumption in an economically feasible way. The electricity market regulation does not enable the sharing of the solar electricity inside the property grid. Distribution grid fees and electricity taxes apply even when solar electricity circulates inside the apartment building through DSO’s smart meters. Consequently, once the FinSolar project is concluded residents of the housing company are at risk of not being able to use 20% of their solar PV production for self-consumption. The Measurement Instrument Directive (MID) is another barrier for community energy IT services. According to the directive, consumers should be able to monitor directly from the smart meter’s display measurement values that are used as a basis of their electricity billing. Currently smart meters in Finland do not display hour-by-hour electricity consumption or production values. In addition, the value added tax (VAT) procedures present a challenge as housing companies are required to report any surplus solar electricity sales (even 1 €/year) to VAT register. This bureaucracy increases housing companies’ financial administration expenses by a minimum 500 €/year, hampering the profitability of the solar investment. 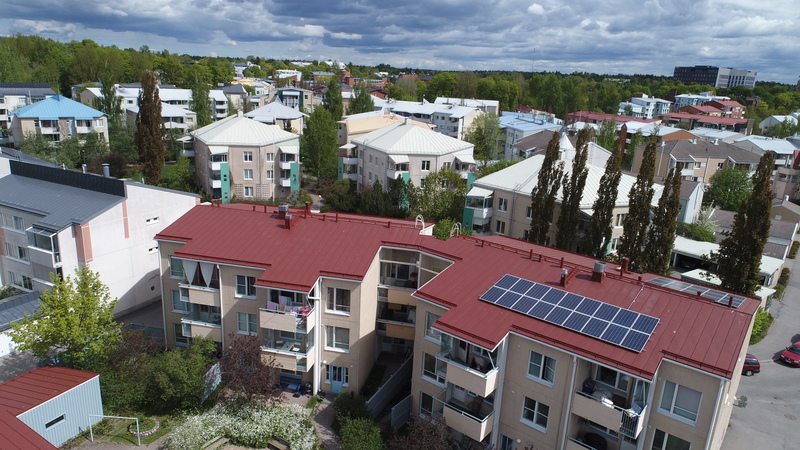 Housing company Haapalahdenkatu 11 is currently looking into alternatives to VAT registration such as selling their surplus solar electricity for free (0 ¢/kWh) to their electricity provider. It is important to have determination and remain motivated to carry out a project and not be afraid if some vocal community members oppose it. The majority of the community members can still support a project even though they are silent during the meetings in which the investment is discussed. One should find the right partners that can help in completing a project, e.g. local DSO, project managers, companies specializing in roof-renovation, energy experts, and local community energy champions. It is important to remove regulatory barriers so that housing company residents can produce solar energy for self-consumption. Incentives, such as investment grants or low-interest loans could make investment decisions easier. Published in September 2018. Original case story and other community energy cases can be found in Co2mmunity.eu website. Ruggiero, S. 2018. Interviews with project leaders and community energy experts. Organisation for Economic Co-operation and Development/International Energy Agency (www.iea.org) and International Renewable Energy Agency (www.irena.org). 2016. Joint Policies and Measures Database.